Create your own spiritual hot spot. This is essential in our world today. Why? Because life happens and yet we must find a way to pull away to hear from Him, reconnect and restore. It is important that we stay full. I often think of Jesus and the constant demand on Him. He gave and He gave and He gave–even when He was in the middle of His own grief. Now when Jesus heard about John, He withdrew from there in a boat to a secluded place by Himself; and when the people heard of this, they followed Him on foot from the cities. When He went ashore, He saw a large crowd, and felt compassion for them and healed their sick. Matthew 14:13. Jesus’ cousin had just been murdered by Herod. You know His heart was hurting. He was God and yet He was also man. He felt the same things we feel. And yet, in the middle of His own pain, He felt compassion on the needs of the large crowd that followed Him and was pulling on Him. He chose to minister to their needs even in the middle of His need. I remember years ago when my husband and I were living in China. We were leaders of an organization that placed English teachers in the universities. We couldn’t go there as missionaries, and so we went as teachers. We had been there several years already when we encountered an intensely difficult season. It was a double hit. It started after one of our teachers was hit and killed by a car one night as we was riding his bike back to the university where he lived after ministering to some of his students. We were still reeling from that loss when another one of our teachers, who had come to visit us from another city in China, passed away on the train on his way back to his home. He was only 27. It was a complete shock to us all. We learned later it was a heart defect, but we were again reeling. After we received the call about his death, my husband and I worked to pull our team together to share the news with them as a group and to allow a time to grieve. Once we had them all together and had just shared the news, I heard a knock on our door. Opening the door, a young Chinese woman I had been ministering to for the last several years was standing there with tears streaming down her face. Ministering to someone else in the middle of my pain was the last thing I wanted to do to be honest. My heart was hurting. I wanted to be together with our team. I needed time to grieve and reflect. Instead I took her in another room and ministered to her heart as my husband, Kevin, ministered to our team. I had to create my own spiritual hot spot. The past two weeks, I felt the same emotion after my mom went into a medical crisis and then passed away suddenly. I wanted to withdraw to a secluded place to be with the Lord, but the immediate needs of the moment and my family dictated that I stay in the moment. My normal morning time where I pull away for prayer with the Lord was not possible as doctors and nurses passed in and out of the hospital room and then family came and went. It was constant. At those times we must dig down deep and pull from the well that is already within us. We have to create our own spiritual hot spot. It’s important to remember that wherever you are can be a hot spot. As you tune into the spirit, it is no different then when we turn on a mobile device to create an internet connection and hot spot. We tune into the spirit and the heavenly connection is immediately available to us—anytime—anywhere. It is essential that we learn, as Jesus did, to find a secluded place to go in our times of grief for times of restoration. Even if that place is in the middle of a crowd. I remember the story of missionary’s Jonathan and Rosalind Goforth who lived in China in the early 1900’s. They had eleven children, five of which died as babies or very young children. Talk about hard. While Jonathan was often out doing ministry, Rosalind was at home alone in a foreign country, taking care of the children that remained. In one of her books she shared of her need to pull away with the Lord, but there was no where “secluded” to go. She was a mom. She couldn’t just leave the children, and yet she needed a place to restore. Probably every mom can relate to that. She created her own spiritual hot spot—in the midst of the chaos of everyday life. So today, as life happens, and you may not be able to pull away to a secluded place to restore, remember, it doesn’t matter. 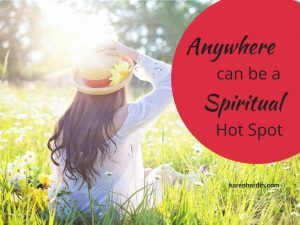 Anywhere can be your spiritual hot spot. All you have to do is “pull the apron over your head” tune in to the spirit and begin to download His comfort and peace and the word He has for your heart. If this word has ministered to your heart, please let me know by leaving a comment below. If you need prayer, reach out to me at here.